ST. PETERSBURG, Fla. -- Minor League Baseball announced today that the Durham Bulls are the recipients of the 41st annual John H. Johnson President's Award. The Bulls will receive Minor League Baseball's top honor at the Baseball Winter Meetings Banquet on Sunday, Dec. 7, at the Hilton San Diego Bayfront in San Diego, California. The John H. John's President's Award has been presented annually since 1974 to honor the complete baseball franchise. The award's criteria are based on financial stability, contributions to league stability, contributions to baseball in the community and promotion of the baseball industry. This is the second time the Bulls have won this award, the first being in 1989 when the club was a Class A affiliate of the Atlanta Braves in the Carolina League. They are the only franchise to earn the honor at different classifications. Since 1990, the team has been owned by the Raleigh, North Carolina-based Capitol Broadcasting Company. The 2014 season was perhaps the most historic campaign in the 112-year history of the Durham Bulls, as the organization witnessed a single-season paid attendance record, renovated ballpark, All-Star Game and an International League South Division Championship. The Tampa Bay Rays' Triple-A affiliate drew a record-setting 533,033 fans to Durham Bulls Athletic Park, breaking the franchise's all-time single-season paid attendance record of 520,952, which was set in 2007. "On behalf of the entire Durham Bulls organization, we are honored to be selected as the 2014 John H. Johnson President's Award winner," said Durham Bulls general manager Mike Birling. "When reflecting on the progress this industry has made over the past decade and how many strong franchises there are across the nation, we are humbled to receive Minor League Baseball's highest accolade. "Our 2014 season was historic in so many ways, and we are beyond proud of our front office staff and gameday team. It is their talent, passion and dedication that continue to make the Durham Bulls brand a special one," added Birling. The Durham Bulls oversaw a massive $20 million renovation of Durham Bulls Athletic Park prior to the 2014 season, an ambitious project that was completed in six months as the team prepared for Triple-A All-Star festivities. Among the improvements were the installations of four state-of-the-art video displays, a robust Wi-Fi network capable of serving 8,000 simultaneous users, an all-new playing surface and new seating and field lighting throughout the stadium. The renovation also included the construction of the new PNC Triangle Club, an upscale 5,000 square foot event space, and Jackie's Landing, a popular social area that provides fans with unique food and drink options and an uninterrupted view of the field and Downtown Durham skyline. 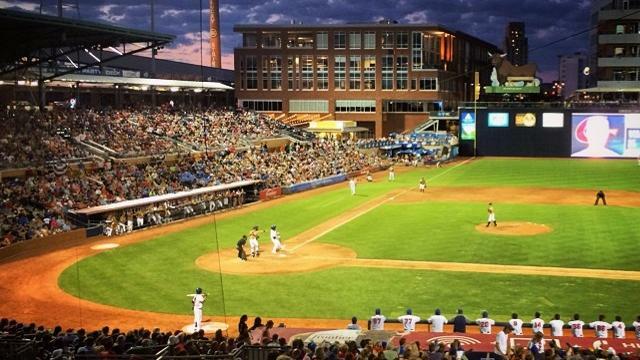 The DBAP and the Durham Bulls hosted the 2014 Cree Triple-A All-Star Game on July 16, the first time the Bull City played host to a midsummer classic since 1997, when it hosted the Advanced-A Carolina League-California League All-Star Game. After a week of All-Star festivities, including an All-Star Fan Fest, All-Star Block Party and the Triple-A Home Run Derby, 10,274 fans flocked to the DBAP to see the International and Pacific Coast Leagues face off in one of Minor League Baseball's premier events. Four Durham Bulls players and manager Charlie Montoyo represented the IL and helped their team to a 7-3 victory over the PCL. On Sept. 1, the Bulls formally announced an extension of their Player Development Contract with the Tampa Bay Rays. The 17-year affiliation between the Bulls and Rays, the third-longest in the International League, has provided the Bulls unparalleled success. The franchise has won 12 division titles and earned 13 playoff berths in that span, while winning the 2002, 2003, 2009 and 2013 Governors' Cup crowns. Additionally, the 2009 season saw the squad earn the title of Triple-A National Champions. "The Durham Bulls have been an example in Minor League Baseball for a number of years and have contributed immensely to the growth and stability our industry has experienced over the past few decades," said Pat O'Conner, Minor League Baseball President & CEO. "The Bulls celebrated one of the most memorable years in their storied history and it is only fitting their efforts be capped by being honored with the 2014 John H. Johnson President's Award. On behalf of Minor League Baseball, I congratulate the entire Durham Bulls organization on a remarkable season and wish them continued success in the future." "Thank you to our fans for years of amazing support, but especially during this All-Star season, which resulted in a record-breaking single-season attendance number. Additionally, thank you to our corporate partners for their ongoing support of Durham Bulls baseball," remarked Birling. "Finally, our gratitude goes to the Tampa Bay Rays and its incredible front office staff, along with the staff from the International League and its president Randy Mobley. Both relationships are imperative to our continued success, and we are thrilled to be associated with such class organizations." "Every member of the Bulls front office staff should take great pride in what this award represents," said Randy Mobley, International League President. "Minor League Baseball is fortunate to have many very well-run franchises, and this award goes to the best of the best. The team that Mike Birling has assembled not only continues to excel at what they do on a daily basis, but the efforts put forth in hosting the Triple-A National Championship Game in 2012 and the Triple-A All-Star Game this past July were nothing short of extraordinary. "The International League could not be more proud of what these individuals and this franchise continues to accomplish. A more deserving recipient of the John H. Johnson President's Award does not exist," added Mobley.